Figure 8-14 Long-term trends in total coliform densities in the Potomac River downstream of the Blue Plains POTW near Gunston Cove, Virginia. Source: USEPA STORET. tomac, it is unlikely that President Johnson's 1965 pledge to "reopen the Potomac for swimming" will be fulfilled because of the lack of beaches along the shoreline and access for swimming. Submersed Aquatic Vegetation, Fishery, and Waterfowl Resources In numerous accounts of the early colonists, the natural abundance of waterfowl and fishery resources of the Potomac basin was considered an important factor in attracting new colonists to the region. Like many freshwater and marine environments, the shallow littoral areas of the tidal Potomac River near Washington, DC, were characterized by extensive beds of a variety of species of aquatic macrophytes, or submersed aquatic vegetation (SAV), during the late 1800s and early 1900s (Carter et al., 1985). Detailed maps in 1904 and 1916, for example, showed extensive "grass" beds in Gunston Cove and shallow areas of the Maryland and Virginia sides of the river. In addition to the direct effect on the survival and condition of fish populations due to low DO concentrations caused by high organic loadings, fish populations are indirectly influenced by SAV abundance, necessary to provide nursery habitat for juvenile fish (Fewlass, 1991). Increased municipal wastewater loading from the Washington area and the resulting poor water quality, were most likely responsible for the disappearance of SAV from the tidal Potomac River (Carter et al., 1985; Carter and Paschal, 1981), first noticed in 1939. During the 1940s and 1950s, widespread losses of SAV were common, not only in the Potomac, but also throughout the Chesapeake Bay basin (Carter et al., 1985). Although the SAV beds were severely diminished by the late 1930s, periodic nuisance "invasions" of submersed aquatic vegetation were recorded in the tidal Potomac during the 1930s (water chestnut) and from 1958 through 1965 (Eurasian wa-termilfoil) (Jaworski, 1990). 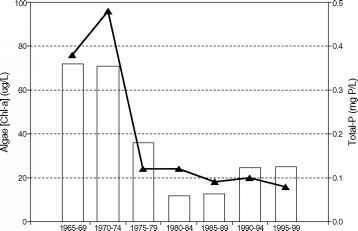 Trends in Suspended Solids Load and Water Clarity By the late 1970s, SAV in the Washington, DC, area had effectively disappeared from the tidal Potomac (Carter et al., 1985). The loss of SAV in the Potomac, and elsewhere in Chesapeake Bay region, has been attributed to the decreased availability of light in the littoral zone resulting from increased turbidity from the discharge of suspended solids and nutrients to the estuary (Carter et al., 1985). 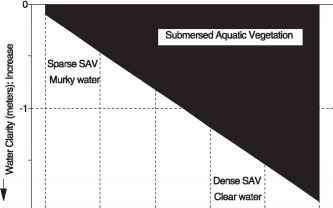 High levels of algae reduced light penetration and inhibited the growth of SAV. The natural abundance of fish and waterfowl of the Potomac, documented by the early colonists, was in fact directly related to the abundance and distribution of SAV in the shallow areas of the river. Redhead ducks, canvasbacks, and migrating widgeons and gadwalls feed on SAV, and other ducks such as mergansers feed on juvenile fish that depend on SAV for spawning and development (Forsell, 1992). The absence of SAV during the 1940s through 1970s resulted in a loss of habitat and food resources for fish and waterfowl dependent on the presence of the SAV beds. Figure 8-15 Long-term trends in municipal wastewater loading of suspended solids in the tidal Potomac River. Sources: Nemura, 1992; Howard, 2001. 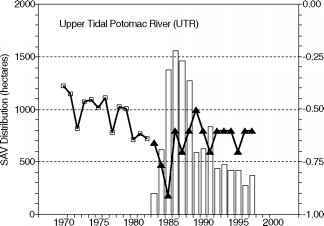 Figure 8-16 Long-term trends in SAV and water transparency in the Upper Tidal Potomac River. 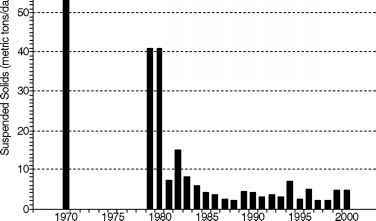 Secchi depth data from 1970-1982 (May-October) from USEPA STORET; SAV and secchi depth data from 1983-1997 (April-October) from Landwehr et al. (1999). Sources: Landwehr et al., 1999, USEPA STORET. Figure 8-17 Long-term trends in summer algal biomass and total phosphorus in the Upper Potomac estuary. Data from Jaworski (2001) for Piscataway station. 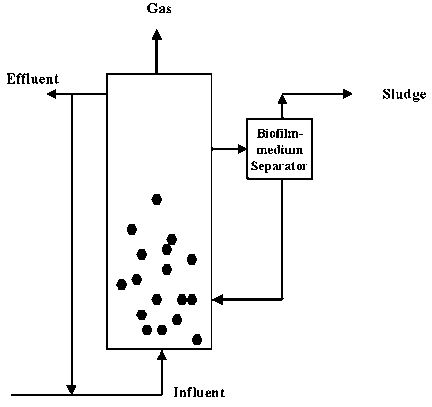 Source: Jaworski, 2001.
hanced water quality by physical settling of particulate solids, filtering of nutrients by plant uptake, and reduction of algal production in the water column (Figure 8-18). The reemergence of SAV beds in the tidal Potomac has resulted in dramatic increases in the diversity, abundance, and distribution of waterfowl (Figures 8-19 and 8-20). Fish surveys documented significant increases in species diversity and abundance from 1984 to 1986 (MWCOG, 1989) that are consistent with the SAV and fisheries abundance data reported for the Choptank River on the eastern shore of Maryland (Kemp et al., 1984) (Figure 8-21). Before the disappearance of the SAV beds, waterfowl populations (ca. 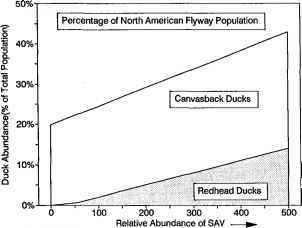 1929-1930) were about an order of magnitude greater than after the disappearance of SAV during the 1950s, when the annual average waterfowl census was 6,547 birds. Historical data from the Upper Chesapeake Bay (1958-1975) are useful to illustrate the relationship between the availability of SAV, fisheries, and waterfowl populations (Figures 8-20 and 8-21). The importance of SAV in the overall biological health of the tidal Potomac is clearly demonstrated with recent observations of a doubling of waterfowl abundance and an increase in the diversity of species (MWCOG, 1989). In 1972, only nine species of ducks wintered in the Potomac tidal river and transition zone (represented by more than one individual observed in winter transect counts); by 1992 the number of species had increased to 17 (Forsell, 1992). Fall-migrating, SAV-eating widgeons and gadwalls, absent from the estuary in winter for 15 years, have lengthened their stay in the Potomac, possibly encouraged by recent warmer winters and more plentiful food supplies. Populations of fish-eating mergansers, increasing since the 1970s, may be responding to increasing fish habitat available since the reemergence of SAV beds. Populations of Canada geese, tundra swans, and mallards, although not directly linked to SAV, are also increasing in the tidal Potomac River; this trend has also been observed in other areas of the northeast. Figure 8-18 Conceptual relationship of SAV abundance and water clarity. Sources: Carter and Rybicki, 1990, 1994; Kemp et al., 1984. Figure 8-19 Long-term trends of waterfowl in the Upper Potomac River. Observations from Washington, DC, to Route 301 bridge. Source: Forsell, 1992. 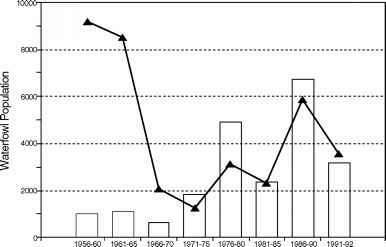 Figure 8-20 SAV and waterfowl abundance in Upper Chesapeake Bay (1958-1975). Source: W. M. Kemp, W. Boynton, and R. Twilley, The estuary as filter, ed. V. S. Kennedy, © 1984, Reprinted by permission of Harcourt/Academic Press, Inc.